Josh Gad has revealed that voice recordings have begun on 'Frozen 2'. The 36-year-old actor voiced magical snowman Olaf in the hit 2013 Disney animation - which also starred Idina Menzel, Kristen Bell and Jonathan Groff - and he has informed fans that the team have started working on the sequel. Taking to Instagram, the actor shared a picture of some of the cast and wrote: "Nothing is more exciting than getting back in the booth with this incredible team. 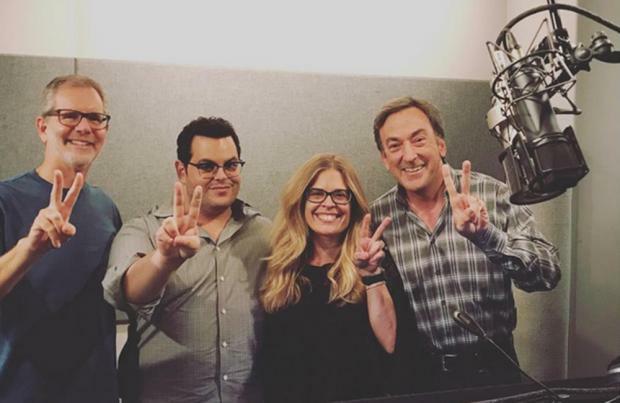 Chris Buck, Jennifer Lee, Peter Del Vecho, Kristen Anderson-Lopez and Bobby Lopez along with John Lasseter and the amazing people at @disneyanimation have created a story that carries on the incredible legacy of the original #Frozen and continues to build and expand on the characters and themes in new and exciting ways. "Unfortunately, that's all I can I tell you right now. But, rest assured #Frozen2 is on the way and damn is it going to be special. 11.27.19. (sic)"
The first movie was inspired by Hans Christian Andersen's fairy tale 'The Snow Queen' and follows the story of a fearless Princess Anna (Bell) who sets off on a journey alongside iceman Kristoff (Groff) and his pet reindeer to rescue her sister Elsa (Menzel), whose icy powers have left the kingdom trapped in an eternal winter. In March 2015, the sequel was announced with Buck and Lee returning as directors and Peter Del Vecho returning as producer. It is not yet known what the plot of the movie will be but Menzel - who voices Elsa - is backing a campaign to give Elsa a girlfriend.